Morality police? I have said that before as a joke. Unreal story! Morality police? Wow! Sad how some human beings are treated. It could happen here....don't think it couldn't. This is the result of religion in government and you can bet there are Christians here who would just LOVE to have this much control over women. I look forward to the day when the women of Iran and the rest of that region, have had enough ! Infidel women born in infidel countries thank The Lord you were born that and live in an infidel country. Let's make sure our lands always remain that . Women are not chattels of men. They should be free to live as they want, to dress as they want and to determine their own destiny. "7,000 undercover(*Belief System)agents are reportedly also on the case. 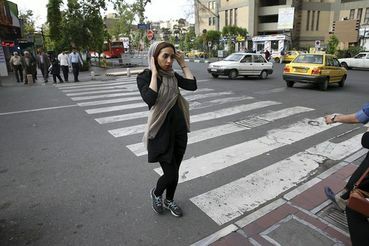 I was spared the early years of the Islamic Republic, but my mother recalls how diligent she had to be to avoid giving the(Belief System)morality police – or anyone else with the(Belief System)authority to judge appearances..."
"The adventures of Iranian citizens with the(Belief System)morality police remind me of Shahrazad and her unending stories. They just go on and on.....And it seems like no one who might want to do anything about it has the power to...."
Hard to believe in 2016 I would fell the need to type the following: Women can dress themselves, no directions from any "authority" are needed. This is what happens when a country is ruled by religion. I am so grateful to live in secular Canada. This is what happens when extremist overtake a Nation. You are correct Pam, we can not be so smug to think it can't happen here or anywhere. Afghanistan use to dress in western style clothes as well now they are in those blue burqas. Pam says it all. Peace! If she was a Baha'i she would have been jailed.